We’d love your help. Let us know what’s wrong with this preview of Hidden Order by John H. Holland. Explains how scientists who study complexity are convinced that certain constant processes are at work in all kinds of unrelated complex systems. To ask other readers questions about Hidden Order, please sign up. Short, quick read. The opening is worth the read as it provides a system perspective of the world where pattern rather than substance defines reality or at least is the only conduit through which reality can be experienced. Specifically interactions in space and time render meaning to objects and we do not experience the objects themselves per se but rather interpolate they exist from myriad of interactions with the same location in space over time using diverse sensory experiences. The book the Short, quick read. The opening is worth the read as it provides a system perspective of the world where pattern rather than substance defines reality or at least is the only conduit through which reality can be experienced. Specifically interactions in space and time render meaning to objects and we do not experience the objects themselves per se but rather interpolate they exist from myriad of interactions with the same location in space over time using diverse sensory experiences. The book then spills into a discussion of genetic programming which is markedly less creative modeling completely after DNA. This part of the books is quite dated and to be honest after a while I just skimmed over. No fat, bare bones book. If it had not been for other books that I've read on complexity, chaos, and emergence, I might have been lost. Overall, good read and fairly easy to get through. J. Holland describes the key properties and mechanisms of complex adaptive systems (CAS). These mechanisms are the presence of building blocks, tagging, and internal models. Properties are aggregation, nonlinearity flows and diversity. He then describes a thought experiment to reproduce "morphogenesis": the emergence of specialisation and aggregation through evolution only. I found the text easy to read, easier for instance than Complex Adaptive Systems: An Introduction to Computational Models of J. Holland describes the key properties and mechanisms of complex adaptive systems (CAS). These mechanisms are the presence of building blocks, tagging, and internal models. Properties are aggregation, nonlinearity flows and diversity. He then describes a thought experiment to reproduce "morphogenesis": the emergence of specialisation and aggregation through evolution only. I found the text easy to read, easier for instance than Complex Adaptive Systems: An Introduction to Computational Models of Social Life. 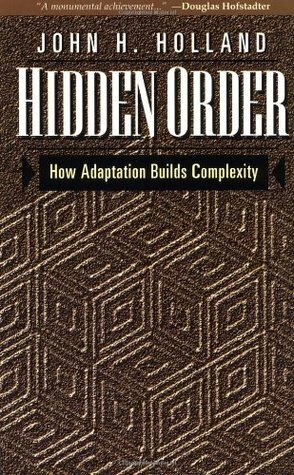 As this is mainly a thought experiment, it leaves me a bit frustrated, but I guess Holland's recent books are worth reading, especially Emergence: From Chaos To Order or Signals and Boundaries: Building Blocks for Complex Adaptive Systems. A great book, but difficult to review. This book raises hundreds of interesting questions but answers very few. If you liked Anti-fragile (Taleb), the Misbehavior of Markets (Mandlebrot), or the Selfish Gene (Dawkins) you'll probably like this as well. I also think reading Thinking in Systems by Donella Meadows before reading this was helpful. If you read books to settle scores, however, you won't like this at all. Curious 1995 introduction to "complex adaptive systems" (from the human body / immune system to cities and economies), the second half is a semi-interesting detailed overview of computer modeling a genetically-evolved agent system to understand these more directly than where the author feels mathematical modeling was struggling to deal with the non-linearity and hierarchical/relational aspects of these systems. Really interesting topic, not very well writtten book. Eu li a versão portuguesa da Gradiva. Estamos perante um tratado extraordinário sobre a complexidade. O autor consegue, numa linguagem acessível, transmitir o state-of-the-art (em 1995) sobre este fenómeno que é um dos mistérios que a ciência ainda não conseguiu explicar nem caracterizar. O autor defende que, através de regras e processos simples, descritos em detalhe, a adaptação gera a complexidade. O único ponto menos forte da obra é o detalhe e as páginas dedicadas a certos pontos que não irã Eu li a versão portuguesa da Gradiva. Estamos perante um tratado extraordinário sobre a complexidade. O autor consegue, numa linguagem acessível, transmitir o state-of-the-art (em 1995) sobre este fenómeno que é um dos mistérios que a ciência ainda não conseguiu explicar nem caracterizar. O autor defende que, através de regras e processos simples, descritos em detalhe, a adaptação gera a complexidade. O único ponto menos forte da obra é o detalhe e as páginas dedicadas a certos pontos que não irão interessar ao comum dos leitores. An interesting primer on the subject of designing and building a model for complex adaptive systems. Holland walks through his work in a way that is accessible to the lay reader, and builds from foundation to completion an understanding of the subject. This work should be of interest to anyone who works in modelling or simulation, artificial intelligence, biology, or mathematics. Though this book's heart is in the right place, it is better titled: The Echo Runbook. Its diagrams appear to come from a nearby whiteboard, not its text. Unless you're an aspiring geneticist, do not attempt this book before reading Complexity. I think THE pioneer of artificial life and genetic algorithms, and mentor to legions. A classic. A model of clear thinking about modeling complex adaptive systems. Should be required reading after Braitenberg's "Vehicles."